A shared love of singlehanded sailing aboard traditional cruising boats brought Teresa Carey and Ben Eriksen together, and with a common interest in simple, self-sufficient living it wasn’t long before this affable, adventure-seeking couple had teamed up for a journey through life. In 2011, Teresa, Ben, and their intrepid orange cat Dory departed Huntington, New York on their Bristol Channel Cutter 28 Elizabeth (with heart-shaped side windows on her dodger) for a 1,600-mile voyage that would take them northward to the waters off the coast of Newfoundland to see an iceberg. Teresa and Ben deliver most of the captivating narrative, which is supplemented by insightful observations on the joys – and hardships – of the voyaging lifestyle from cruising luminaries Lin & Larry Pardey, Pam Wall, Amanda & John Neal, Jaja & Dave Martin, John Kretschmer, Nigel Calder, Yves Gélinas, and George Day. The film also addresses climate change, with scientists Fiamma Straneo, Wallace J. Nichols and Andreas Muenchow providing commentary. When Teresa and Ben learn that a massive, 100-square kilometer ice island had broken off of Greenland’s Petermann Glacier, the largest floating glacier in the Northern Hemisphere, a chunk of that ice became the object of their quest. Featuring stunning cinematography by Chris Rodriguez, Larissa Powers and Derek Alan Rowe (and Teresa & Ben) and a stirring soundtrack by The Accidentals and Steve Goldstein, this is a truly wonderful film. If you are a school teacher or a sailing instructor, you’d do well to show it to your students as soon as you can. 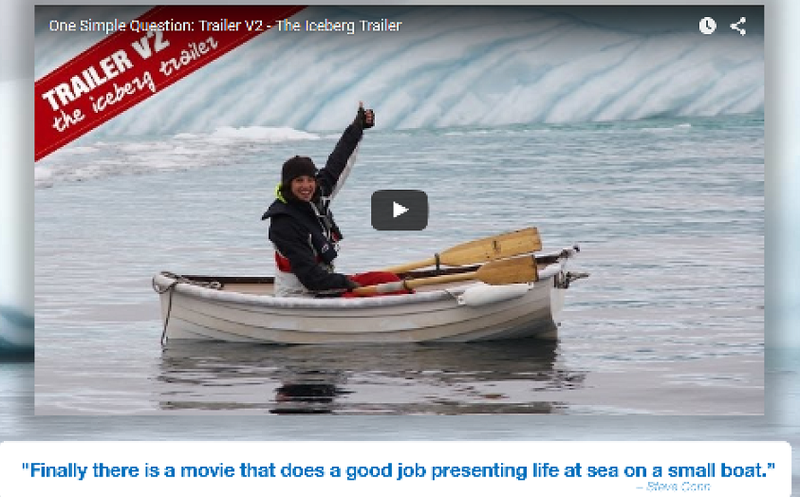 To order a DVD of this exceptional film, or learn about how you can host a screening at your club, community sailing center, marine business, school, library or home, log onto simplequestionmovie.com.